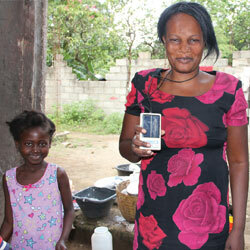 Your generous gift will help bring hope to Haiti! One solar radio can reach a household of approximately 6 people, broadcasting the life-changing message of hope from Radio 4VEH for years to come. The radio also includes an audio Bible in Haitian Creole, especially helpful for those who can’t read. Please see our FAQ page for details or call us directly at 317.888.3333.